If you are having trouble finding time to make it to the gym, or maybe it’s really cold where you live and you can’t get outside to run or walk, you can always bring the gym home to you. There are plenty of ways to get fit and stay fit in the comfort of your own home with your own equipment. The wide range of elliptical machines are a perfect way to get exercise, keep fit, lose weight – all without leaving the house. Here we’ll take a look at some home elliptical machines. This front drive machine is top of the line in price range. It provides a smooth, fluid motion while in use, and is very quiet, even when using it at top speed. The magnetic resistance requires little maintenance, and these machines are built to last, work, and support. You can adjust the resistance and the steepness of the incline you want. It offers an adjustable stride, a large 30-pound flywheel, 20 different resistance levels, and 20 incline levels to maximize the workout. The moving arm bars are excellent for total body training, and the handles come with heart rate sensors. It has a console screen with 10 pre-programmed workout videos, and a Bluetooth capability to update stats with other fitness apps. You can use the Bluetooth to connect to your tablet, computer, or smartphone as a program monitor. Some other features are two cooling fans, a water bottle holder, iPod connection with speakers, and a space to secure your tablet. There is also a wireless heart monitor with straps and extra large foot pedals for comfort and safety. Overall, it’s a great workout machine, but it is rather large and could be uncomfortable or awkward for smaller users. NordicTrack is another popular name in exercise and fitness equipment, and there is no surprise why. This elliptical exercise machine has a center drive, and also and has a treadmill, stair climber, and elliptical capacity – all within a simple adjustment. It features over 20 resistance choices for higher intensity and keeps the workout low impact at whatever level you choose. It also has an iPod connection with speakers, hi Def touch screen for coaching or the internet for your own choice of class or viewing, and the free flowing pedals move across belts rather than tracks for a smoother, quieter workout. Overall, it’s an excellent choice for home workout equipment. Bowflex is another trusted name high up in the exercise field, and their elliptical machines are no exception. This elliptical machine is compact and powerful for a full body workout. It has 16 different intensity levels, and with the movable handlebars, the upper body gets worked as well. The low impact workout is perfect for getting into shape without risk of injury to joints or muscles and gives you fluid, smooth movements. There is a console backlit screen with nine pre-programmed workouts and a space for a magazine or tablet, plus water bottle holder. It also features a wireless chest strap to monitor heart rate, and pulse rate with the contact grip system. Both you and someone else can monitor and save your data in the system. This is a great choice for the home gym – it is relatively compact, so it takes up less space, which is important if space is limited. This is a unique elliptical machine that allows the user to replicate a true running experience without the impact on knees, ankles, and hips. This cordless machine gives you no excuses for working out during a power outage. It also has settings for stair climbing, walking, and various running and jogging speeds. You can connect your Bluetooth to track your data and access workout programs. There are other cross-training options for upper body workouts, and it has two spaces for holding your tablet. This piece of equipment is compact too – it is easy to use in smaller spaces and has attached transport wheels for easy moving about. It doesn’t collapse and does not have moving arms, but this machine is excellent for the runner who cannot run the traditional way, due to weather, sore joints, or mild injuries. Exerpeutic 100XI Heavy Duty is one of the best elliptical workout machines for the lowest price. This machine is built to withstand a good workout, and if that’s all you need, then this may be the machine for you. It comes with a console screen to monitor heart rate, distance traveled, calories burned, time, and speed. Compact and sturdy, there are eight resistance settings and this machine has movable arms for upper body workout as well. Large, sliding pedals can be used for forward and backward striding, and they are ribbed to prevent slipping. Plus, it has a capacity of up to 300 pounds. Not bad for one of the lower priced models. It does require maintenance and may not be as durable in the long run as some other models, but if you only need it to work out now and then, you can’t go wrong for the price. The name Schwinn is synonymous with bikes, and their name is known worldwide. So it should come as no surprise that they also make an elliptical machine. It’s a rather excellent one, at that. Keep in mind that this machine is a beast – it’s great for taking a good pounding for the user, but not great if you need to move it or tuck it away. This machine has an LCD screen and has 29 programs built in, including 12 workout programs, the capacity to play your own music from your iPod or tablet, and the capability to charge your phone while you exercise. You can download exercise classes or music, and it has the capability to store the data of up to four users. It has a large, motorized ramp with six resistance levels up to a ten-inch slant, and you can do it all while you are in motion with the touch of a fingertip. There is a water bottle holder and a three-speed fan to keep you cool, and you can track all of your workout data, including speed, time, distance, and heart rate. Overall, you can’t go wrong with the Schwinn name and brand, and this heavy duty machine will give you the workout you need with a lot of great features – all in a reliable piece of equipment. The Nautilus E614 is the perfect machine for your workout needs. Built strong and durable, this machine will deliver a lot for a reasonable price. An older model, it’s still very popular due to its low price and durability. It has 22 pre-programmed workouts, and you can track your progress (time and distance). It also features a great set of speakers for all your favorite music, or maybe to simulate the workout program as someone shouting at you to move it or lose it! There are transport wheels for easy moving to a new location, and the three-speed fan will keep you cool. This machine from a trusted name will serve you and your family well for many years. It doesn’t have a lot of computerized features, but if you want a machine to workout, this is the one to choose. 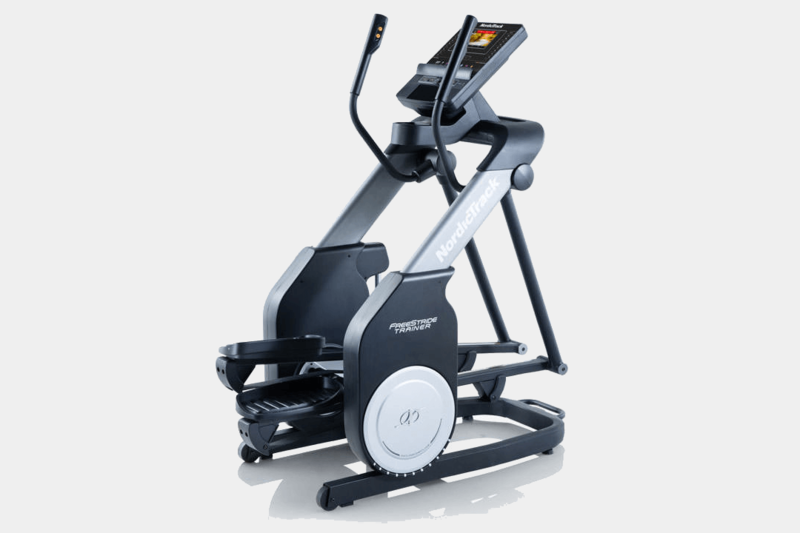 This sturdy, dependable machine comes with a magnetic braking system that allows the user to have a low impact workout with excellent resistance. Movable handlebars keep the upper body toned as you walk or run your way to better health. Complete with five workout programs, this machine also offers warm up and cool down modes for the complete workout. There are three cross-training programs to ensure that you get the complete upper and lower body toning and exercise, and three heart rate interactive programs. There are 20 levels of intensity to increase your results or just have an easy day, and ten ellipses angles from 8 to 28 degrees. Track all your progress with the computerized data to chart your speed, time on each segment, heart rate, calories burned, distance traveled, and even calories burned per minute. This machine is very popular and well received, and has been used professionally for therapeutic uses due to the comfort and low impact qualities. Comfort comes from the front drive and the narrow body, allowing the pedals to be closer together. They are placed lower so that you can easily get on the machine. This elliptical is complete with a reading rack for a magazine or your tablet. You will enjoy a full body workout on a trusted, reliable machine. This machine is in the higher price range. Another elliptical machine from the trusted name of NordicTrack, this one, called the SpaceSaver, is sleek, easy to move, easy to store, and yet still durable and sturdy. Much smaller and lighter than some, it still has the capacity to handle up to 325 pounds, which is no small feat for a smaller model of machine. It still performs like its bigger brothers with back wheel drive and a magnetic braking system that keeps the ride smooth and quiet. This machine is almost perfect coming out of the box, is easy to assemble, and has 24 preset workout programs and 22 resistance levels to keep your workout increasing. It also features a computer system with programs, a tablet holder, water bottle holder, space to plug in your own MP3 player, and speakers for those who like to dance and run. Plus, the built-in fan will keep you cool. It’s mid range on the pricing, but excellent for those with limited space. Another from the NordicTrack Family, this center drive machine has the magnetic braking resistance for a quiet workout, which is great for those who share their space or need to be aware of the downstairs neighbor. It’s a smaller, sleek machine with a professional performance that you would expect from the gym or health club. It has an adjustable stride and 24 different digital resistance levels and a heart rate monitor in the handlebars. This comes with large, adjustable pedals and a built-in fan. It can also handle up to 350 pounds, which makes this machine durable and sturdy. The computer system has a ten-inch touch screen with Bluetooth and 35 preset workout programs to choose from, or you can connect to the internet and find your own favorite workout or music to follow along with. The console buttons make it easy to change up the resistance or programmed workout. It features a water bottle holder and front wheels for easy transportation – all make this elliptical machine top of the line and very popular. The Sunny Health and Fitness family is well-known and trusted in the world of exercise equipment, and with a name like Sunny, who can blame them? This particular piece of equipment, the Sunny Magnetic SF-E905 Elliptical Trainer, is sleek, small, and very reasonably priced in comparison to other elliptical machines. There is magnetic resistance with tension adjustments, and movable arms for upper body workout. If all you need is a machine to workout, without a lot of bells and whistles, and affordable, then this may be for you. It’s smaller and convenient to store, as it can be folded and slid into a closet or under a bed. Some features are movable handlebars, ridged pedals to prevent slipping (and they are built with two-way striding for forward and backward motion), and a transportation wheel. The low price also makes this a desirable machine. However, if you plan to use it a lot, it may not be as long-lasting as some other machines. It has a computer system but no pre-programmed workouts, but it can track your heart rate, distance, calories burned, speed, and time. If all you want is a bit of exercise, and you don’t mind about all the extra features, this machine would be fine, in particular if you have to watch your spending. One of this affordable and unique machine’s best features is its two-in-one machine. In just three simple steps, you can turn the elliptical trainer into a recumbent bike. This ensures that you get a full body workout, or you can just alternate days between the two types of equipment. Built tough, this machine is built to last and perform. With the magnetic resistance system, your workout is quiet, and there are 16 resistance levels and another 16 pre-programmed workout videos to keep your workout varied. It has adjustable, moving arms, and the seat and pedals are also adjustable to fit anyone using it. The pedals are extra large for comfort and safety, and the arms are padded for comfort during those longer sessions. There is a tablet holder, which is compatible with Bluetooth, and there is an iPod dock if you choose to use it. It also has open access to iFit, and it has a Watts Power meter to keep track of users’ pacing and let you know what to do to burn more calories and meet your goals. The price is right for this piece of equipment that is actually two pieces of machinery, and the features and durability make it hard to beat. This heavy machine does not fold away, but is sturdy enough to take a lot of workouts. An elliptical machine, or elliptical trainer, or cross trainer is used to exercise the upper and lower body. Similar to a treadmill, it is a stand still piece of equipment which may or may not have movable handlebars and other pieces to work the upper body. They fall into the category of low impact, as there is no heavy pressure on the joints. Unlike a treadmill, these machines can simulate walking, running, and stair climbing without increasing the chances of injury from actual running on hard surfaces. There are different types of elliptical machines: some are self generated, and some are electronic and have various settings and resistance levels. There are varying degrees of models, as well. Some are perfect for home use and some are more heavy duty, for professional classes and gyms, built for constant use. Test Drive ~ This is very important, even if you regularly use elliptical machines. Try it out first, make sure it fits you properly and it has all the features you want or need. You need to make sure it is comfortable to use, that your legs are not too short or long, and that you will enjoy using it. This is particularly important for those of you who have never used a machine of this type before. Try out for a few minutes in the store, or take a few classes, or try out a few machines at the gym or health club. It’s a good idea try to use as many different types of machines there are available at any place you are visiting, and see which one you like best. This way you will understand the size, type, and different features that will be important to you. This will give you a chance to check out the added features, computers, heart rate monitors, and other additional features like iPod and Bluetooth connections, how the adjustments work, and what you like and don’t like or don’t necessarily need. Cost ~ If you are looking around, whether online or in the store, you will see that there is a huge difference in the price range. This is down mostly to features, and then down to computerized features. The machines range from home use to professional and many in between, but again, don’t buy the first one you see because it’s all shiny, you need to buy within your price range, once you find the one that works best for your needs. It’s an expensive toy to just hang your clothes on. Also, unless you know for sure what you are getting, avoid the temptation to buy a used machine from a friend or from online sources. You won’t know if it will fit you and your needs, you won’t have a warranty, and you may never know the real reason they are getting rid of it. If that is the route you take, get a look at it and ask plenty of questions. Take it for a test drive and try all of the features to make sure they all work properly. Needs ~ This applies to what your goals are and what you need to get out of the machine. If you only want an elliptical machine to use on days you can’t get out to run, or get to the gym or for a small break when you work at home all day, then you can get away with a smaller, cheaper model. If you are looking to seriously get in shape and need something to keep you motivated and looking forward to meeting new challenges, then something that can track all your data might be best. Are you the only one who will be using it, or are others in the household going to also be working out on it? If it’s to be multi-use, then a sturdier, well-built machine will be more beneficial. Also, if you share the space where you live, or have to worry about neighbors hearing you workout, the machines with a quieter resistance system, like the magnetic braking systems, are better. Space ~ It seems obvious, but the space you will be using your new elliptical machine in is important. You need to be able to move on and off the machine without hitting things in the room – you don’t want to break things nearby by hitting them while you are working out, like grandma’s antique vase or the front picture window. If the space is limited, then you need to look at a place to keep the machine where it’s not in the way or find one that is foldable and can be stored away, under a bed or in a closet. Many of the machines have transportation wheels attached, so you need to figure out if you will need to be moving it from room to room, or around the room. If it needs to be mobile, then the lighter models are an obvious choice for regular transporting. Measure the space where it will be used, the space where it will be stored, and whether there is enough room in the area it will be to be moved, turned, and effectively used. Size ~ Yes, size does matter, and it goes along with the space issue, but also for your usage of the equipment. You need to find the machine that fits you, or can be adjusted to fit you. Find out if you are comfortable on the machine and your arms and legs reach the arms and pedals of the equipment. You don’t want to risk injury or strain trying to complete the exercise. The size of the equipment itself needs to be able to fit in the space you plan to use it, and you don’t want to find out you can’t fit it in the room or get it back out again. The height of the equipment should be considered if you have a low ceiling and you will be standing up – you don’t want to bash your head with each step. The pedals may be upwards to 15 inches off the floor, so you will need to factor in the width your height and the height of the ceilings. Plus, the pedals may need to be extended while in use, and the arms that are mobile need enough space to extend out and not take out the window or punch a hole in the wall. Computer ~ Most exercise equipment comes with all sorts of computers and allows you to track all of your workout statistics, play the preset workout videos, or connect your Bluetooth or iPod to the system. Some can connect with fitness apps to track all the progress and information to keep you on track with your goals, and may even motivate you to break your new record. You can even connect to the internet, join a real class, or even lead one all from home. While these features are great and appealing, they do drive the cost of the machine up considerably, so think about what features you want and need or just the ones you like. As fun and fancy as these might be, the novelty can wear off, and it’s also not always easy to fuss with technology while your arms and legs are all busy. Perhaps the best way to track your progress is a good healthy sweating session and the fact that your blue jeans are getting too big. It’s also something to consider for those on a smaller budget. The point is to workout, and unless you are in training or a professional, you may not need it all tracked and stored in several places on the internet and social media. The results will show themselves where they are needed, in your accomplishments. Adjustments ~ Unless you find the perfect piece of equipment that works and fits perfectly and completes all the tasks you want it to, (you probably won’t) you want something you can make adjustments to. This will apply both to the fittings of the machine and the resistance levels. All machines will have a variance in the resistance levels, so find out how many and how much there are. The magnetic systems tend to provide more, so if you plan to increase throughout the long term, these are the best. They also require almost no maintenance for the system, as there is no metal on metal or metal on material rubbing and wearing down. If you are only looking for a good workout now and then, to combine with other exercise you do, you may be fine with one that has a smaller range for intensity. Try it out at the first level, and then about half way through. There should be room to grow within the resistance to intensify the workout and maximize the muscle tone and growth. Also, check to see if the adjustments can be done automatically or manually, as it may be awkward to do while moving. Programs ~ Along with the computerized system comes programs to help you workout. You can also have customized programs just for you. They can be motivating and get you to be more willing to exercise, but they also may just be an extra cost you don’t really need. If you feel like it will get you to workout more and you are someone who likes or needs the motivation, then find out what the preset programs are and be sure you will use and enjoy them. If you choose not to get the programs, you can always find a program to follow along with on your tablet, iPod, or laptop. If you are used to being in a class with an instructor and are just starting to workout at home, then a few programs to help ease you into the new environment might be just the right choice. Warranty ~ A warranty is just as important as the other features, and is a testament to the trust that the company and manufacturer has in the equipment. The warranties can really vary from make and brand, and as the frame is normally a lifetime warranty, parts and labor will vary a great deal. This usually varies with the price of the machine. Also, check to see if the braking system is on its own warranty. The lower priced machines may have a warranty for parts and labor for only 90 days, where an expensive, more top of the line machine may be covered for three years. These may also be separate warranties, parts for a certain period and labor for less. Be sure to ask about these and even find out about the price to have to get things repaired or replaced. It may not be worth it if you have to replace the equipment in a few months after purchase. As to that, find out about their return and refund policy, if you have to pay for shipping, or if they cover that. Buying an extended warranty is up to you, but as a rule, it’s rarely worth it. Safety Features ~ Some of these systems don’t have instant braking systems, which may be important if you need to get off the elliptical quickly, for whatever reason. It can make a big difference regarding safety if you get clothing or other exposed parts caught in an emergency situation. It’s important that moving parts have covers and shields to make sure you don’t get clothing or shoe laces caught up in them, or that you don’t get scratched, burned, or otherwise injured from regular use. It is important to have things covered if household items are resting too closely to the moving parts of the machine. Getting something caught up in the flywheel can not only damage the items, but also cause untold damage to the equipment itself. It should be noted that keeping children away from the equipment is vital, as they can get fingers caught or pinched, or worse. Keep the equipment in a safe area, secured or covered if there are children present. We hope this will help you on your way to finding the perfect elliptical machine for all of your home workout needs. Always do your research when making a big purchase, and try out the equipment to make yourself familiar with it all first. Make a list of what you want and what you can live without. Don’t be afraid to ask questions at the store, at the gym or health club, and ask your friends and family. With all the available choices, should have plenty of options for picking out a new machine for your new health regime. Be smart, be patient, and do your homework, and you should be able to have a happy, healthy workout space in the comfort of your own home.